For NaNoWriMo I put aside the alternate reality, time travel-ish scifi novel I’d been writing and started something completely new. While I didn’t hit the 50k word goal, I did get a great foothold on the story and a lot of worldbuilding in. For now I’m calling it Wyvern’s Wings, though as with most things that may change. Just for kicks, I’m going to give a bit of a rundown on the story and the characters I’ve got so far. There will be a map at the end for reference. So what is Wyvern’s Wings? Well, it’s a fantasy story, for one thing. And I guess it qualifies as part of the Young Adult genre, given that the protagonist(s) are teenagers. The story follows two characters: Sabine and Cecily. Here’s a quick rundown of the plot, and then I’ll go into some characters. Sabine Corwen is the daughter of the king, his only child and heir to the throne of Viranthia. Cecily is a member of the mercenary company The Black Wyverns, and used to be Sabine’s undercover bodyguard, traveling with her everywhere under the guise of a handmaid, the last line of defense should the royal guard fail in their duty. She was also much more than that, and when the king found out about their relationship he had Cecily banished from the kingdom despite Sabine’s protests. But Cecily isn’t one to take that sort of thing in stride. She hatched a crazy, impossible plan – she would recruit a dragon to help her “kidnap” Sabine. Reunited, the two of them could live out their lives together in peace. Unfortunately, the world has a habit of turning plans on their head. While Cecily tracks down the dragon Vortax in Sardir, far to the south, Viranthia is gripped by a coup. The Duchess Greymoore seizes the throne while the kingdom’s armies are away fighting a war with neighboring Urdomar. King Corwyn is killed, and Sabine barely escapes assassination herself. Hearing of the chaos in Viranthia, Cecily races home with Vortax in tow, not knowing if Sabine is alive or dead, and determined to wreak bloody vengeance if it’s the latter. At the same time, Sabine becomes entangled in a counter-rebellion that either aims to restore her to the throne or use her as a convenient figurehead with which to seize power. Magnus Corwyn, king of Viranthia. 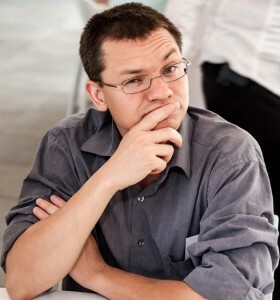 Magnus didn’t remarry after the queen died, leaving his daughter Sabine an only child and heir to the throne. 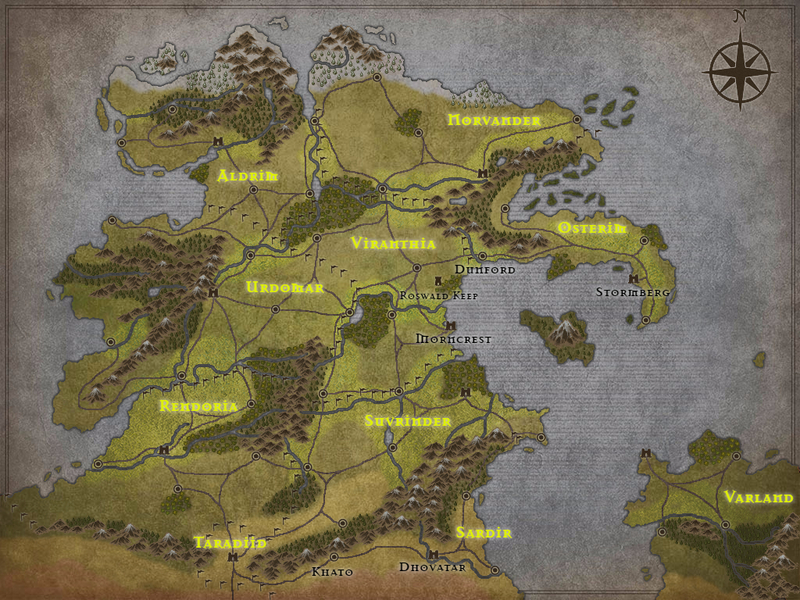 Under his rule Viranthia has become embroiled in a war with neighboring Urdomar, a war which is slowly being lost. To keep things going he has slowly increased both taxation and conscription for the military, making him unpopular with the people. He meets his end when Duchess Greymoore seizes the throne. Sabine Corwyn, princess and heir to Viranthia. Seventeen years old, she has a rocky relationship with her father, though the public would never know. The weight of responsibility as heir weighs heavily on her, a burden that felt lighter when Cecily was around. Recent events have made that relationship worse. Cecily’s banishment was one, the other is the marriage her father arranged to Prince Rothar of Osterim. The marriage would unite the two kingdoms under one rule, in the long term, and in the short term make Osterim’s troops available to push back Urdomar. And then there was the coup, and everything turned upside down. Cecily Wyvern, mercenary. Wyvern isn’t her actual last name, though in truth she has no idea what it would be anyway. She doesn’t know her father, and her mother is a vague memory from long ago. But that’s not to say she doesn’t have a family. Ruark, leader of the Black Wyverns, took her in whenever it was she lost her parents, and has been her surrogate father for her entire life. Growing up in a mercenary company she was treated as part mascot, part everybody’s kid sister, and they taught her a lot of things. At seventeen, she’s equal to just about anyone in a fight. Those skills got her a contract to be Sabine’s bodyguard, and fate took it from there. When she lost Sabine and was exiled, it took away both things she loved – Sabine and the Wyverns. But that’s ok, because she’s got a plan to turn everything around. She just needs a dragon. Ruark, mercenary leader. Ruark is the leader of the Black Wyverns, and has been since he was a young man. Through circumstance and history, he was also a friend of King Magnus Corwyn, and the Wyverns benefitted from a lot of work doing things the kingdom’s troops couldn’t or shouldn’t be seen doing. It also led to Cecily and Sabine coming together, and it was only Ruark’s intervention that got Cecily banished rather than imprisoned. With Magnus dead and Sabine in need, Ruark leads the Wyverns in joining the nascent counter-rebellion. He, at least, is determined to see her back on the throne, though he has his doubts about many of the other nobles involved. Duchess Evaline Greymoore, usurper of the throne and former marshal of the army. Greymoore is a middled aged woman who has always had an eye for seizing the day. Appointed one of the kingdom’s military field marshals, she has long made it a point to appear extremely loyal to the king. But when Viranthia’s armies are all occupied fighting Urdomar, and the nobility and commoners both come to dislike King Corwyn, she sees an opportunity. Claiming to fight for the welfare of the people, and backed by a cabal of treacherous nobles, she seizes power. Her first act is to cede land to Urdomar for a quick peace and end the war, but things start to go awry when Sabine turns out to be alive and leading a rebellion against her rule. Sabine isn’t the only problem – other kingdoms are eyeing Viranthia like wolves circling a wounded deer, and Cecily hasn’t even shown up with her dragon yet. Ethan, royal guard recruit. Twenty years old, Ethan had just finished training and induction into the royal guard when the kingdom collapsed around him. His first assignment was to help guard Sabine’s carriage as the princess went to meet her future husband, Prince Rothar. It ended in an ambush and bloody disaster, and while he managed to pull Sabine to safety in the woods he is at a loss for what to do next. As Sabine becomes involved in the counter-rebellion, he settles into the role of silent bodyguard. He’s the last of the loyal royal guard, after all, and he intends to see that Sabine stays alive to reclaim her throne. Indigo, Black Wyvern mercenary. 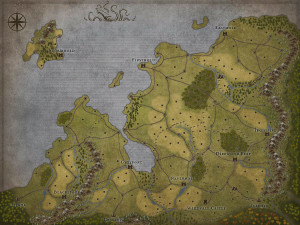 Indigo was down south in the trade city of Taradiid when the coup happened, looking into business opportunities for the Wyverns. He’s also gotten himself into a lot of trouble with the city guard when Cecily comes through on her way north. Thanks to her he gets out of it, and joins her on the way back to Viranthia. Barros, gang leader. Being a major trade hub, Taradiid has no shortage of gangs and criminal organizations. Barros leads one, using his street runners to steal from merchants and city guard alike with puckish impunity. When he was a younger man, he worked with Ruark when the Wyverns had a contract to provide security for the city. The two of them worked both sides and shared profits, becoming good friends. He even remembers Cecily from when she was tiny, and agrees to help her get back north to Viranthia under the condition she make sure Ruark was ok, and get him to send Barros a friendly hello from time to time. Kinja, one of Barros’ street runners. Lithe, agile, fast, silent. Kinja is one of Barros best street runners, able to get into places unnoticed and fight her way out of trouble with equal aplomb. She is chosen by Barros to accompany Cecily and Indigo to Viranthia. Vortax, dragon. Vortax lived relatively quietly in the desert canyons of Sardir, hoarding stories, books, and scrolls. When Cecily comes looking for him he agrees to help after she explains what she wants, and promises that she will give him a most valuable thing he could never get elsewhere – the opportunity to actually take part in an amazing story. Obviously, this isn’t a comprehensive list of characters, but I think these are all of the important ones (so far). When I come up with more, I’ll be sure to make additional posts detailing them. Well, I haven’t posted much about that game that I mentioned in my last post, but rest assured there have been game sessions. I may even do some writeups here at some point. In other news, I have query letters out to agents for my fantasy western book Goyle Country. Here’s hoping somebody likes the sound of a fantasy/western adventure mashup. Also, I’ve started work on a third book. This one is an alternate reality sci-fi story. I’m already on chapter three, with about 3200 words put in. Not too shabby, really. I’m aiming to have it finished before November so I can throw a fourth project at NaNoWriMo. I think I’m on track for that, but we’ll see how it goes! I’ve been working on the setting for a Burning Wheel campaign I’m about to run and, honestly, creating the map has been just as fun all on its own. I thought I’d share some progress shots here, given that I may post a bit about the game just to get this old website moving again. 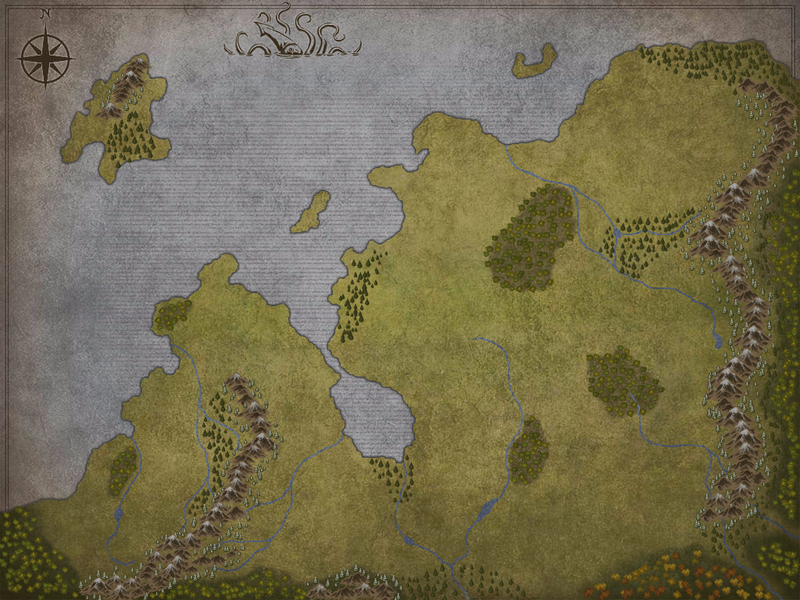 This is all made using a free online map making tool called Inkarnate, and is nowhere near as cool as you can get when using it to its fullest extent. 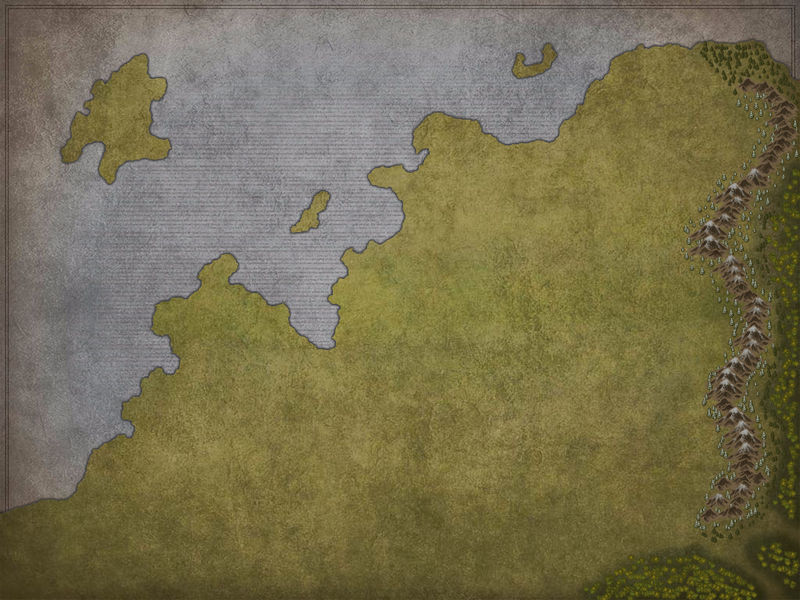 I started off with a more or less random coastline, then added in the big island. I knew I wanted some hard geographic limits to the gameworld, hence the mountains right off the bat. I added a bay/gulf thing and more mountains for flavor, then added rivers and finally forests alternating pine and leafy varieties. Yes, I know they have scientific names. No, I’m not using them. Finally, and this took the longest, adding human kingdoms. Settlements, fortresses, roads, and farmland round it all out. Typing along on the Fantasy Western after a week or two of not writing because I had the plague, when suddenly… crap. Where did I leave the dynamite? I have to know where I left the dynamite. Plot cannot progress without knowing where the boomsticks are. Blergle. Ah, having to delete 500+ words because you realized a thing you were doing was no longer possible because of a plot point many pages ago. Gotta love writing. Haven’t been writing as much as I’d like lately, work has got me a bit brain fried. But I am roughly five thousands words past the original ending, so there’s progress being made, slowly but surely. Say, how about an update? I’ve already caught up to the wordcount I had prior to axing the ending of the Fantasy Western, but I’m not quite done yet. Part of redoing the end was adding a bit more to certain subplot and character interactions. That’s going well, I think, and I’m trying not to stretch the ending too far out. I’d like to keep this book shorter than the 170k-ish words that Clockwork & Old Gods ended up being. So far it’s sitting at just shy of 70k. That’s a whole hundred thousand words less! Good gods, that first book was a monster, wasn’t it? Well, the free book promotion seems to have been a success. 284 books given away! Including, oddly enough, three from this morning after I thought the promotion had ended. But hey, what’s three more free copies? Thanks to everyone who picked up a free copy or helped spread the word. I’m looking forward to seeing what sorts of reviews this generates, good or bad. And in the meantime, I’ve gotten the Fantasy Western (which stubbornly refuses to take on an actual title) nearly rewritten. Fourteen pages to go and then I’ll be asking people to beta read.